There is a red line linking the two events that will characterize this upcoming week in the Vatican: it is Truth. 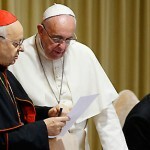 Both the so-called Vatileaks 2 trial and the presentation of the post-synodal apostolic exhortation Amoris Laetitia (that will take place, respectively, April 6 and 8) deal with the veracity of the information disseminated, although at different levels. It is now important to put every piece in the right place, without confusing the levels. Sessions in the Vatileaks 2 trial will be resumed Apr. 6. In the week leading up to this, the media resumed its attacks on the Church. Other documents were leaked to the Italian magazine, L’Espresso. The article there was written by Emiliano Fittipaldi, one of the journalists on trial in the Vatican for stealing documents. The article reported that a Vatican investigation was taking place over the funding of the restoration of Cardinal Tarcisio Bertone’s apartment. Cardinal Bertone still lives in the Vatican, but took another apartment after he had to leave the apartment in the Apostolic Palace to which he was assigned while serving as Secretary of State. Too much attention has been paid to Cardinal Bertone’s new apartment. Journalistic reports overestimated its size and spoke about a sumptuous terrace that in fact is the terrace that belongs to the entire building. In the end, COSEA – the Pontifical Commission of Reference on the Organization of the Economic-Administrative Structure in the Vatican – discovered that the restoration was paid for by the “Fondazione Bambino Gesù,” a foundation linked to the pediatric hospital owned by the Secretariat of State. On the other hand, Cardinal Bertone had always claimed, with documents in hand, that he had personally paid for the restoration of the apartment. In the end, it seems that the restoration has been paid twice. The company in charge of the restoration got both the payment of the Cardinal and of the Foundation. Why the Fondazione Bambino Gesù insisted on paying for the renovations despite the fact that Cardinal Bertone insisted he did not want to impose upon the Foundation – is still an open issue. However, if one reads attentively the letters between the Cardinal and the Bambino Gesù president, it is clear that Cardinal made the decision to go it alone in paying for the restoration. Why, then, were his words decontextualized and forced? And why, above all, is Cardinal Bertone always a target? What does a trial in the Vatican look like? These are hard questions, on the eve of the resumption of a trial the reporting of which is clearly the subject of media bias. Gianluigi Nuzzi, who authored the book “Via Crucis” and who is also under indictment, showed up at Pope Francis’ general audience on March 30 to talk about the trial, after which he granted a long interview to an Italian newspaper. As usual he defended his reporting, complained that the Vatican is blaming the journalistic profession, lamented that the Vatican still adheres to the Zanardelli Penal Code that is 127 years old and claimed that he and the other accused journalist were only doing their jobs. But Nuzzi’s is only a partial reading of the facts. No one is questioning the work of journalists. This is not a trial against freedom of the press. The Vatican has not initiated any lawsuits for defamation nor has it requested that the books be withdrawn from sale. The trial is about the stealing of confidential documents, a crime under Vatican penal law. However, it is worthy of note that the same crime is contained in the Italian penal code (art. 262) and in the CEDU (the European Convention for Human Rights). The trial will reveal whether the journalists (together with the other defendants, Francesca Immacolata Chaouqui, Lucio Vallejo Balda and Nicola Maio) are pleading guilty or not. After the first hearings, it was revealed that the exchange of documents did not merely involve the passing of documents between hands. Journalists were provided with the passwords of the confidential e-mails of the Vatican Commission, and they took the documents from there. It is as if one were to give away the code to open a safe; such an individual would be an accomplice, but the thief is the person who opens the safe and personally removes the goods. The trial, then, is a regular one. True, the Zanardelli code is 127 years old, but it is more liberal than the Italian penal code, which was drafted and adopted under fascism. Would the defendant prefer to be judged under a legal code developed in the fascist era? There are other hard hitting questions. Why do the defendants want to keep media attention high surrounding the trial? And why does the press keep saying that this is a trial contravening the freedom of press? An expert in international law, Paolo G. Carozza, emphasized in remarks to ACI Stampa that this is part of a trend within the press to preserve itself. True. But a suspicion is nevertheless aroused by this lone explanation that the system is out to preserve itself. The additional explanation that there is wider system behind the leaks can be explained by a detail caught only by a few people. The last session of the Vatileaks 2 trial took place on March 15. Nuzzi was not there. He had to be at another criminal trial in which he faces charges, this time in Italy: the Esselunga trial. Esselunga is an Italian supermarket chain. During the last years, Esselunga unleased an advertising campaign – even an aggressive one in the media – against another supermarket chain that is by tradition associated with the Italian Communist Party and, today, with a certain part of the Democratic Party. Nuzzi was charged with slander and with receiving stolen goods, together with the editor of the newspapers to which he contributes. To keep the story short, the two accused journalists blamed a manager of the rival supermarket even though they knew she had committed no wrongdoing, and to support their accusations they published – according to the prosecutor – “a false document that was reproduced in its entirety.” The prosecutor also claimed that the journalists had bought a CD-ROM filled with wiretapped telephone conversations (illegally acquired) of the managers of the same supermarket, and made use of the data on this CD-ROM. The charges of receiving stolen goods then were dropped, but not the other charges. In the end, Nuzzi was sentenced to 10 months imprisonment, but with the sentence suspended. The fact that Nuzzi was charged and sentenced in Italy for almost the same crimes is a further indication of his modus operandi: he collects documents – sometimes through means that stretch legal bounds – and then he uses these documents for defamatory purposes, or else with the intent of manipulating public opinion. Can Nuzzi’s reading and interpretation of the documents, in the end, be 100 per cent reliable? These, too, are hard hitting questions. Vatican investigators are called to search for the truth, while the Vatican’s communications staff needs to be able to make this truth reach a wider audience in order to change main stream opinion and shake up consciences. This is very important. It is through pieces of biased truth and accusations replete with innuendos that attacks are made against the Church. Paolo Carozza suggested that looking at the trial “not in isolation but in a larger geopolitical context where we know with certainty that there are actors, for example in some human rights organizations, who would very much like to be able to strip the Holy See of the status it has in the international community. Is there a connection between reactions to this trial and those larger political controversies? I don’t know, but it is certainly something worth asking about and reflecting upon”. It is certainly worthy asking about, as the campaigns against the Church’s moral teachings are advanced while the big game behind moral attacks against the Church is played out. Sources who have read the exhortation agree: there are no doctrinal catastrophes – so much so that those who were campaigning for revolution began a long time ago to parade themselves before the media: Cardinal Walter Kasper (by coincidence, the apostolic exhortation will be presented on the feast-day of Saint Walter) spoke about a revolutionary test, but then he made a partial u-turn; the historian Alberto Melloni – a champion of the interpretation of the Second Vatican Council as a “rupture” – stressed that the apostolic exhortation represents a compromise, but that this does not bring to a halt the big reform of the Church which for Melloni consists only in a reform of the Roman Curia; lastly, many leftist observers are emphasizing the new role to be given to bishops, along with the Pope’s push for a major integration for civilly divorced and remarried Catholics, who will be able to be chosen as godparents at baptism; and, finally, there is a document delivered by the General Secretariat of Bishops to Bishops all over the world. The document is a “reading guide” of the upcoming exhortation, which focuses on language more than on contents, and has attached excerpts of the theology of body by St. John Paul II. Will the post-Synodal exhortation represent a revoution? 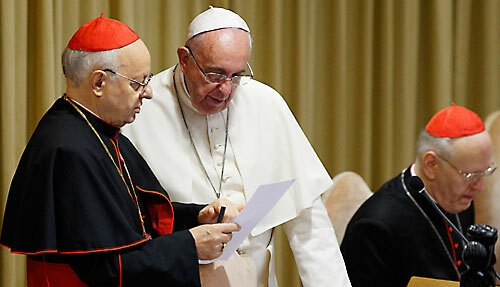 From what we can perceive, the post-synodal apostolic exhortation will offer a long casuistry. One will not find not much about gay couples, which was a groundbreaking topic during the 2014 Synod. Proof that homosexual love was not central in the apostolic exhortation was given by the fact that on the very day the date for the publication of the document was announced, one of the news portals closest to Pope Francis reported some chosen excerpts from the memoirs of the former mayor of Rome, Ignazio Marino. In the excerpts, Marino recounted how much the Pope reprehended him for having registered homosexual civil unions in Rome. The text of the exhortation will be long (according to rumors, about 180 pages) and will not hit the core of the issues, thus leaving the door open for possible changes in the disputed questions. This is the reason why those who are pushing their own agenda behind Pope Francis’ back are preparing to fill in these areas. Not by chance, the exhortation will be presented by Cardinal Christoph Schoenborn, Archbishop of Vienna. His ideas were expressed in an interview granted to Fr. Antonio Spadaro for the Jesuit-run magazine La Civiltà Cattolica. Cardinal Schoenborn never breaks with doctrine, but sometimes he seems to override doctrine with praxis. His presence will calm down those who want to adapt the doctrine to the spirit of the world. These people are somewhat agitated by the fact that the content of the document will not reflect the revolution they expected. The other presenter will be Cardinal Lorenzo Baldisseri, General Secretary of the Synod of Bishops who is sincerely convinced that the Church has to make a leap forward and acknowledge modernity. In the end, public opinion on the exhortation will be shaped by these two similar opinions. However, there’s every likelihood that these opinions will not fully express Pope Francis’ view. The Pope recently addressed the issue of the access to sacramental Communion for civilly divorced and remarried Catholics (during the in-flight press conference from Mexico), and deconstructed the narrative surrounding his pontificate, often presented as a break with that of Pope Benedict XVI. At the same time, Pope Francis is also convinced that realities are more than ideas, as he affirmed in the apostolic exhortation Evangelii Gaudium. How will he combine these contrasting souls within him? Will the post-synodal exhortation introduce some changes in doctrine or will it be just a pastoral document? The issue is crucial. True, post-synodal apostolic exhortations are not the usual ways for popes to treat technical doctrinal issues. Also true, Pope Francis issues pastoral documents, and he wants to highlight the “pastoral” part in naming the documents (he also described as a “pastoral document” the joint declaration with Patriarch Kirill). But how much can pastoral issues can be separated from doctrine? This is the reason the upcoming post-synodal apostolic exhortation will deal with Truth. How much will the apostolic exhortation give in to “public opinion” that wants a Church deprived of its prophecy while kneeling down in front of main stream thought? How much will the apostolic exhortation accept as its rationale that the Church should mature and embrace, for instance, civil unions? How much will the apostolic exhortation be able to affirm that the faith is one and has been revealed? How much, in general, will the Church accept a sort of Protestantization of Catholic thought? This is where the two events – the Vatican criminal trial and the presentation of the apostolic exhortation – merge. “When its resistance could not be overcome – Cardinal Mueller added – some of its elements were allowed to remain, but not Christianity in its substance; the result was that Christianity ceased to be the criterion of all reality, and the aforementioned subjectivist positions were encouraged”. We are now living in a new non-Christian and relativistic anthropology that “dispenses with the concept of truth.” Despite this, the Church’s teachings are still firm and rooted in people, and many enjoy the Church’s teachings, whether they are Catholics, or they belong to other confessions or they are even non-believers, as demonstrated by the extraordinary success of pro-family initiatives in France, Italy, Slovenia, Slovakia, and Romania. All of these initiatives – mostly demonstrations – had the blueprint of the Christian notion of family. All of these initiatives saw a huge number of participants. Because of this consensus, secular forces push to relativize the word of the Church, exploiting the Pope’s words when they are not very clearly expressed. At the same time, there is a continual attempt to deprive the Church of its international authority. Attacks are focused on the Church’s morality (through ugly campaigns, like those against Cardinal George Pell, Cardinal Philippe Barbarin and all the attacks on pedophilia in the Church, in spite of the huge response of the Church to correct its errors). Attacks are also focused against the Holy See’s sovereignty. But above all, attacks are focused against the possibility for the Church to perform her good works; hence the attacks against the Holy See’s finances. Finances are a tool, not the end, for the Church. And Vatican City State is a tool, not an end. Whenever the Holy See’s sovereignty and its ability to manage a financial system in order to sustain itself and deliver money to its missions is put into question, the Church is denied the right to exist at an international level. In the end, the Church is denied the opportunity to defend the common good. Likewise, whenever the doctrine of the Church is attacked, the goal is to erode the basic principles in which the Church roots its defense of the common good. This is how secularist forces – who took the ground in many branches of the Church – are waging their war. If Catholics do not come to understand this, secularism will achieve its final victory. Cardinal Schoenberg is an embarrassment. He is exactly what is wrong with the Catholic Church. He talks ‘conservative’ but is a liberal and his ‘praxis’ proves it. He doesn’t discipline renegades or radicals — he engages in ‘dialogue.’ He’s been dialoguing for 30 years — when is enough enough ? I don’t know if I am more embarrassed or sick to know I belong to this Church. We are under siege and these idiots are concerned with the temperature of the air and reaching out to those who spit on the faith. Then they want to know why Catholics don’t support the teachings of the Church ? You can’t make this stupidity up. FrankieB, this is a time (long prophesied) of the Calvary and Betrayal of the TRUE Church! PLS, do not be discourage, but understand what is truly going on.